Otherwise everything below this point is left as it was at the end of the contest. Everything has now been submitted. This post now has a set of notes and images detailing the final models below the fake update page image. We all know the Soldier isn't what he says he is, since he was rejected from every branch of the US military. Despite this, his uniform has several elements that show that he considers himself good enough to be among the airborne units. His boots are reminiscent of the paratrooper's jump-boots. 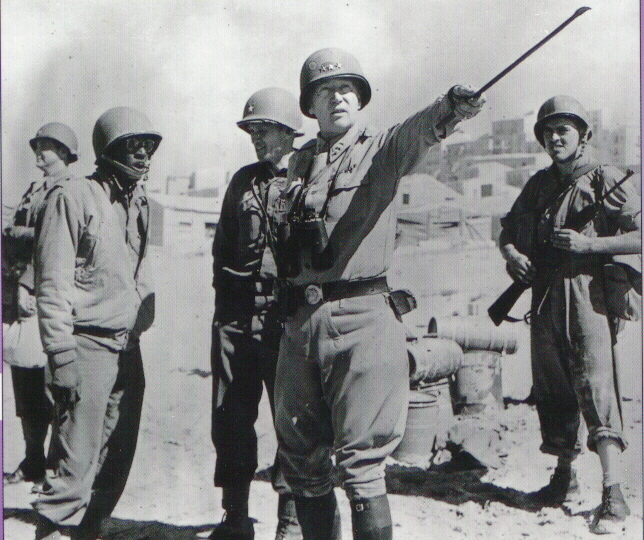 His jacket has a high collar, which was a specific modification to their uniform. The screaming eagle motif is actually the insignia of the 101st Airborne Division. Given how paratroopers were deployed into battle, there was a lot of interest in reducing bulk and weight of equipment. The M1A1 carbine with a folding stock was one of their weapons, and modification of kit along these lines was not uncommon. While the Soldier has elements of paratrooper uniform already, there's practically nothing of it in his weapons. That's what I aim the Airborne Armaments pack to be - a set of weapons that reduce weight and bulk, since if the soldier considers himself paratrooper material, he's going to have gotten himself the weapons for it at some point. I'll be honest, the excuse to do a rocket launcher that's based around the various Bazooka models is the main reason for this pack. The name is a play on what paratroopers do (jump) though it could also imply rocket jumping, and is also a reference to the origin of the name "Bazooka", which was the name of a novelty instrument that the GI's decided it looked like. When your primary fails, deploy your reserve. The name Reserve Shooter is a play on the term 'reserve parachute', since parachute is often shortened to 'chute, and reserve parachutes are often refered to as 'reserve's, along with the shotgun being a secondary/backup weapon. I could call it "the reserve chuter", but I doubt people would pronounce that properly without knowledge of the background. This name appears to originate from the so called 'whipit' gun, a sawn down automatic shotgun used by Bonnie Parker in the 1930's. The term since evolved to encompass a fully functional pump action/automatic shotgun that has been sawn down either to bring it within gun regulations or to reduce the size and weight, making it easier to conceal. Since law enforcement appropriated the idea for undercover work and the like, I'm going to assume that branches of the military would find a use for it  especially since the paratroopers' gear was modified to reduce bulk. The Soldier's shovel is an entrenching tool (type M1943), a short handled version of your regular garden implement adapted for trench digging and the like while being easy to carry. 'Entrenching tool' shortens to 'e-tool', a term which I've found evidence of use in WW2 and I've decided to develop one based on a variant that first showed up in 1951, the combination shovel-pick folding e-tool (M1951). This choice is mostly based on the distinct shape it has when folded in pick mode. The name 'market gardener' is a reference to the weapon's appearance as some kind of deranged gardening implement, and to Operation Market Garden, one of the major operations the airborne units were deployed in in WW2. Since the Soldier's model seems to already incorporate one of the most recognisable things about the paratrooper's uniform  the jump boots  I don't really feel I have much to do other than the weapons. Since the model's version are simplified though, I might look into a pair of boots anyway if I find the time, since some of the accessories added to the game have added a level of detail quite a bit higher than the original character models. To tie the weapons together visually I''ll be doing a colour scheme that ties them together. I'm hoping I'll be able to find a tone of olive drab (the name of the military green colour) that will complement TF2's existing palette. I'll put a swatch up here once I've figured out my all my colours. The two concepts here are based on real models, but are both a lot shorter than the real launchers. I could have also considered the M20 version but that doesn't differ in appearance to the M9 very much. Overall I prefer the M9 version, since the shoulder stock looks a lot more lightweight than that of the M1 - assuming a shoulder stock wouldn't have too many clipping errors to get away with. By the looks of things the overall tubular shape is going to be simple to make and differ greatly from the other launchers, and the detailing is going to be where the work is going to lie. Interestingly the name Bazooka comes from the name of a comedy instrument used by a popular radio comedian. I made a quick hack job and tested in HLMV, and it works convincingly with all the animations, in both first and third person. Compared to the standard shotgun the length reduction is proportionally similar to the difference between real shotgun models. Again, it looks like the devil is going to be in the details. 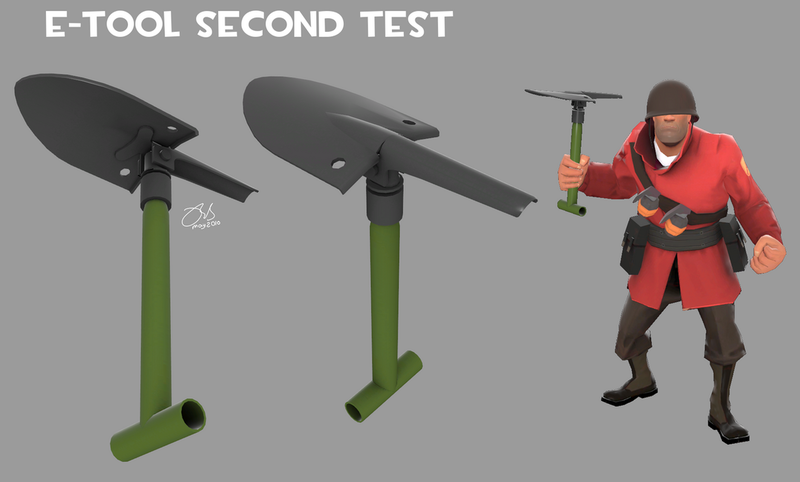 After a bit of research I found out that the Soldier's standard shovel is already the most compact design of entrenching tool of the time period. Damn. At the moment I think it's a toss up between an M1910 and the concept marked 'Hybrid Design', which includes elements of the M1943, M1910 and my original idea of a metal-handled tool. It seems these things are known as 'E-tools', which may be useful for coming up with a name. At this point I'm undecided whether I should work on all three alongside each other or concentrate on completing one at a time. I'll probably look into starting work on the launcher or shotgun first since they'll both need quite a bit of work. I decided to work on the shotgun first since I'd need to determine a grip design that looked appropriate but didn't introduce a load of clipping problems with the Soldier's hand. I tried a grip style like the one labeled 'pistol grip' in the above concepts, but it didn't feel right and intersected his pinky. You would see that intersect everytime you reload. At the moment the pump and the trigger area need the most work. I'd welcome any opnions about the shape of the pump, since I have a lot more freedom in that area compared to the handle and I'm a little unsure about what shape to go for. Ideally something that helps the gun look short, if that makes any sense. I'll probably give the shotgun a rest to come back to it with fresh eyes and start work on the rocket launcher in the meantime. I really like the shotgun model and the concept art but it seems almost the same to the original weapons to me, this is just my opinion, of course. Looking good! The only thing I'd suggest is finding a way to make your submissions more unique like in that shotgun concept with the shells attached. Right now it looks like a slightly modified stock shotgun. Maybe the texturing would make it more unique but the size/proportions of everything make it very similar to the other one. Also if you want to go a bit more modern or for something more unique, here's a suggestion for the shovel. It's more compact, has the fold at the tips and has the serrated edges for more damage if used as a melee weapon (That's actually the real purpose of it for the Military version). Keep it up! I'll be watching this thread, has some promise so far. Yeah that was precisly the reason I thought about at least one attachment for it, I'll be looking into the possibilities. I did come across the modern E-tool design in my research, though I dismissed it primarily because the handle wouldn't work with existing animations and the shovel head is unchanged from the last WW2 models. They also fold in 2 places rather than one (awkward), and it seems they were first introduced in 1963 (passable). I didn't realise they were serrated though, I may pinch that feature of them, thanks! Testing the shotgun was done with a hack-job model before I started work on the real thing, but I couldn't do that with the bazooka so this model will probably get turned into the real thing. A lot of the detailing is unfinished or omitted, since I'm more interested in clearing up potential animation faults before it becomes a lot more troublesome to do so. As you can see I've found a few. By the looks of things a shoulder stock would have to be quite different to those on real bazookas in order to not clip noticabley. Probably more work on the bazooka so it's a bit further along, at least until the clipping is all sorted like with the shotgun. As for right now, sleep time. Two things. The rocket launcher concept looks really cool, but I think it should be a bit more stylized in regards to proportion. If you look at the soldier's current RL's they're very distinctive based on proportion. Second, if you can't find a better shovel to use, why not just choose a different tool that soldiers used in WW2? 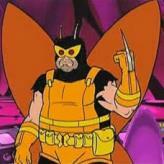 Or, you could go with something like this. There's already a shovel, and there's already a pick, but there's not a shovel-pick. Doesn't look very interesting of a pack that you're creating. Nothing looks different enough from the original models to be something that draws attention. Using real life weapons like "the bazooka" is a rather bland thing to do. Two things. The rocket launcher concept looks really cool, but I think it should be a bit more stylized in regards to proportion. If you look at the soldier's current RL's they're very distinctive based on proportion. I get what you mean, but in order to retain the look of a bazooka I'm going to have to leave the main tube alone, since the simple tubular design is part of its own distinctive shape. This means that to keep it in line with the other designs I only have the positioning/proportions of the detailing to play with, which is restrictive, but I don't think it'll be too much of problem. 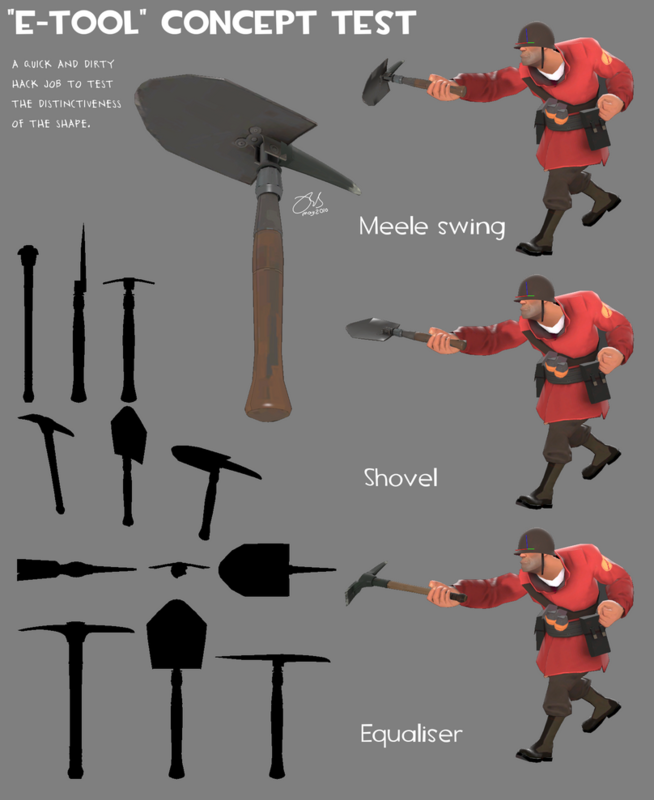 Second, if you can't find a better shovel to use, why not just choose a different tool that soldiers used in WW2? Browsing kits I haven't really seen much else to go for other than a combat knife, but I'll keep my eyes open. I came across that too, I believe it's the M1951 E-tool. It's definately distinct, but since they're apparently noticabley heavier than the M1943 (Soldier's shovel) type it may not fit the theme of going for lightweight variants, but I'll bear it in mind. I'll probably do a set of tool heads and handles when I get round to the first steps of the meele weapon to see what different combinations look like. Following up from the first model I looked into ways of solving the animation issues whilst also testing some more details. After finding some better reference material I'm probably going to redo the handles, but otherwise this is somewhat close to what it'll look like. Probably some spades, to get that moving as well. I really don't get the comment that real life weapons are bland, since almost every weapon Valve themselves have made have very firm roots in reality, it just isn't always obvious. The same holds true to the community weapons they've implemented so far as well. 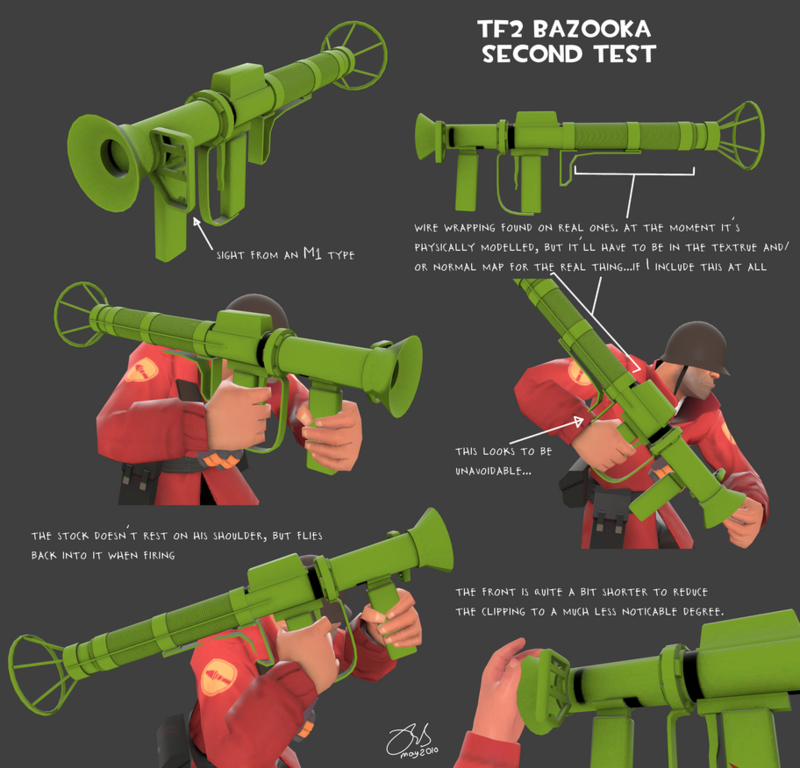 And who said I was actually going to call it "the bazooka"? Can't a man work with a placeholder name to refer to his stuff?? Thanks for the input. Given the relative complexity of the shovels I aim to not dismiss meele designs until I've seen at least a rough version in the flesh, so I'll probably put up a compilation pic of the designs when I get there. This is coming along really nice! Has a very solid TF2 feel. That, sir is a *nice* orkish rocket launcher. really digging that bazooka dude. You may call me Noob. Total Noob. yoplatz, your suggestion rings true, it looks way more distinct than any shovel variant, and is different enough from the other weapons to work. It didn't really occur to me that the short handle these things have would make the combination e-tool look a lot different from the Equaliser until I'd gathered my reference models together. So I built this hack-job to test it. I see a few of you are worried about this thing not looking distinct enough with just the shortening of it. Your're probably right, but I've been looking into ways of dealing with that and have a few ideas. I already have a favourite but I'll give you guys a taste of these things before I go ahead and implement it. I've also come across a potential name for the gun, but I need to find another source to back up that finding. Build a proper E-tool model and look into head/handle shapes. 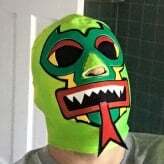 I've updated the first post with some clarifications to my theme, since my research has turned up some things that influence it. I've gotten quite far with building the E-tool. It has some smoothing errors that need clearing up, some parts need optimistion, there are missing details like rivets, and the handle needs to be done properly. Also this looks like it's probably another shade of green to throw on the discard pile. I've tested this model in game, and it feels different enough from the others to work well. The little things like the rim and holes on the back end of the shovel part also seem to be quite important in first person, as they seem to draw the eye. I'd welcome any comments on the handle though, I'm not too sure about the T at the bottom now that I have a model with it in front of me. Something about it feels a little awkward (although arguabely the entire weapon is...). Some love for my now named shotgun. maybe wrap a cloth or some rubber grip around it? For the pin-ups, have you looked at the team calendars in the spawn rooms? I'd advise you to make some colour studies of your Bazooka before settling on the modeling. I tried to make a rocket launcher with just dark and darker greys myself (save for the handles) and quickly found that it didn't work; the contrast between the metal and the wood is pretty essential for the weapon's design. There's a chance you can get away with just metal, because you've got a pretty strong silhouette, but again, do a test to see if it actually is so. As for the melee weapon, it's not terribly creative and I think that's a weakness. Personally I was thinking of him swinging around a broken off propeller to fit with the air theme, but that might be too silly. Pretty nice stuff so far. That would be down to personal interpretation of what fits. I could be more outlandish - as a number of other entrants are doing - but I don't see that as being necessary. Eh? Are you thinking of this entry? A pinup probably wouldn't fit my stuff since they seem to be more associated with bombers and the air force than the paratroopers themselves. I've not seen a glider with one on it. Well since I have to organise the details of both the bazooka and the shotgun, I was considering looking into the colour scheme for them at the same time so I could see how colour and silhouette variations interact. It'll proabably be the next thing I do. I don't think a bit of a plane would fit since the airborne units spent more time out of aircraft than in them, so I don't really see any strong links to draw inspiration from aircraft. You might be right in saying that it's an unimaginative weapon though, but there isn't all that much to play with without going too far from the other weapons, and I'm pretty happy that this feels different enough from existing ones. It was also fun to make, which is big plus in my eyes. Damn it, wrong thread. Sorry about that. To change the shape of the shotgun significantly, while making sure it still looks and functions like a shotgun, I went for a folding stock that folds over the top. 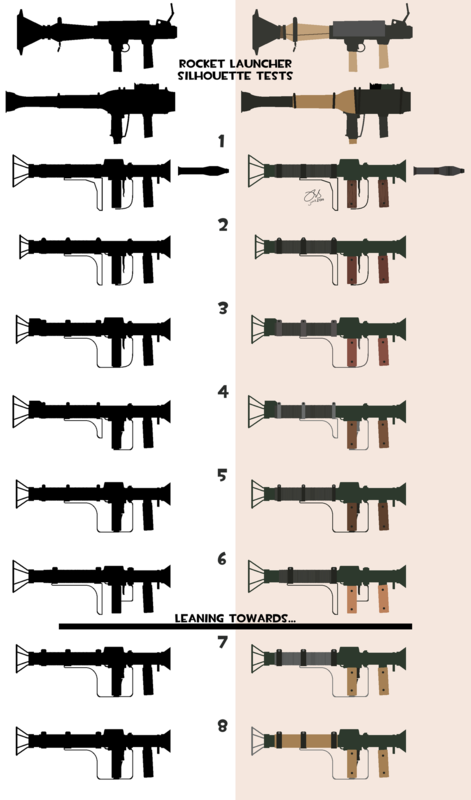 I thought about using a side-folding stock, but that would only give visual interest to the user or an observer, depending on which side it's on. A top folding one like this is visible to all and impacts the side-on shape of the gun. The most common example of a stock that folds like this looks rather plain and modern since it's made from pressed metal. It carried that look into the model when I tested it too. So I decided to make my own, styling it after the folding stock of the paratrooper's M1A1 carbine, and I rather like how it turned out. Colour wise, I decided to see what it would look like if I used the colour pallette of the only waepon in the game with green on it so far - the Direct Hit. It happens to be close to a promising shade I came across in my research. Probably bazooka stuff, I've been doing some basic silhouette and colour studies with it and it looks like Zwebbie was spot on about colour having a huge impact, even before you put the thing on a character model. quite a harsh looking little thing isn't it? Wow! That stock made all the difference in the world! I was afraid, like some others, that your ideas were just not interesting enough visually. But, the shotgun modification is quite redeeming. Keep up the good work. With all the default shotguns in the game, it's great to see people taking it on and making it unique! It's got the look I'm after then! Hey man this is why it's all work in progress! Exactly why I'm having a go at it. 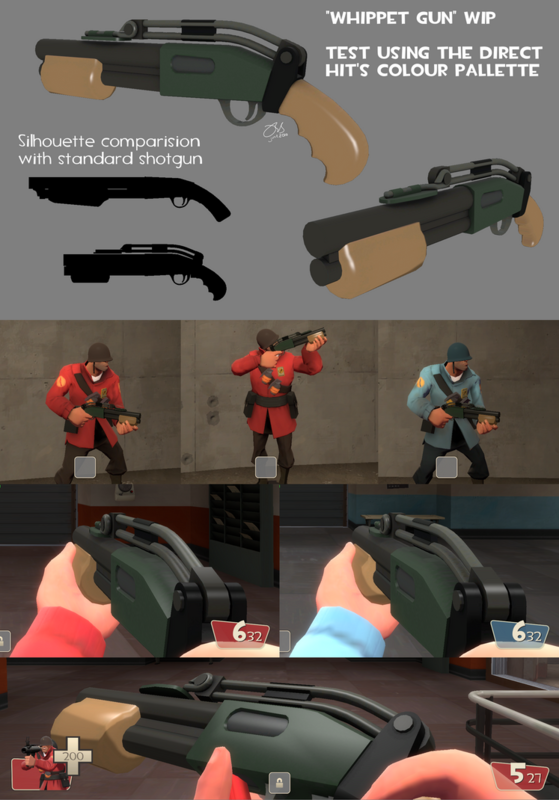 Since to test it in game it replaces the shotgun used by everybody so I've seen it in all the class' hands, and it only really fits the Soldier in regards to the changes in shape (and it really doesn't fit the heavy since it's a tiny baby shotgun). This comes from the thought of making a play on the fact that it looks like a deranged gardening implement (which is pretty much what e-tools are anyway) and a reference to Operation Market Garden, one of the paratrooper's major operations in WW2. The Panzerschrek also got a nickname based on what it looks like - Ofenrohr (stove pipe). Thing is there's already a stove pipe in the game since that's an english name for a top hat, so to go along the same lines it would have to be the Chimney or the Smokestack, or some other pipe-like thing. So, thoughts? More research needed? The shotgun could use a little work, but not every single weapon in TF2 needs to be broken, taped, splintered, burned, or broken. The cleanness of the shotgun still keeps it looking like a stock 'skin swap' replacement as opposed to a brand new weapon with stats. isn't the point of this comp is to make a model that will be made into a NEW weapon? and this is the soilder we are talking about, why would his guns NOT be scuffed? 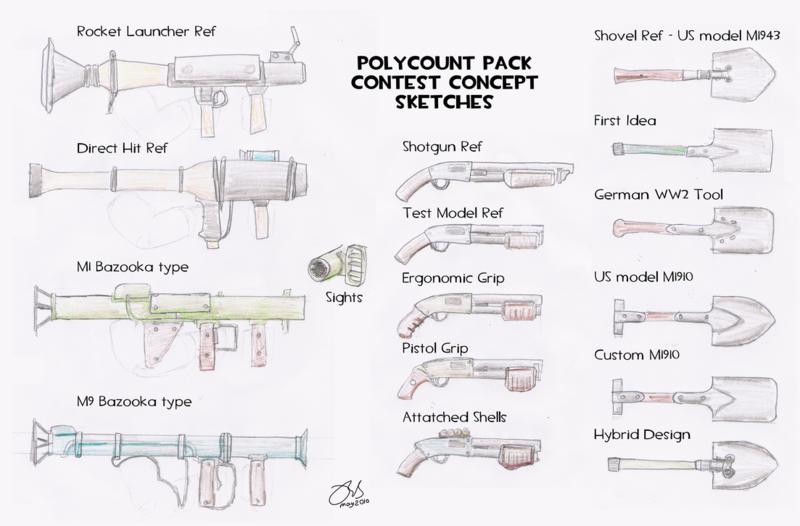 The main goal of this contest is to remodel existing weapons, so in essence it sort of is a skinning contest. Maybe have a knife welded/ bonded to the right side of the shotgun for a bayonet? I am sure it is to model new weapons, the only thing preventing completely new weapons is the default animations...and I know of several people who are animating their weapons. and duct tape is a Mann's best friend. It probably looks a little plain since there's no detailing on the pump and there are no bolts on the body - both of those will be in the texture, along with any paint/metal wear and tear. 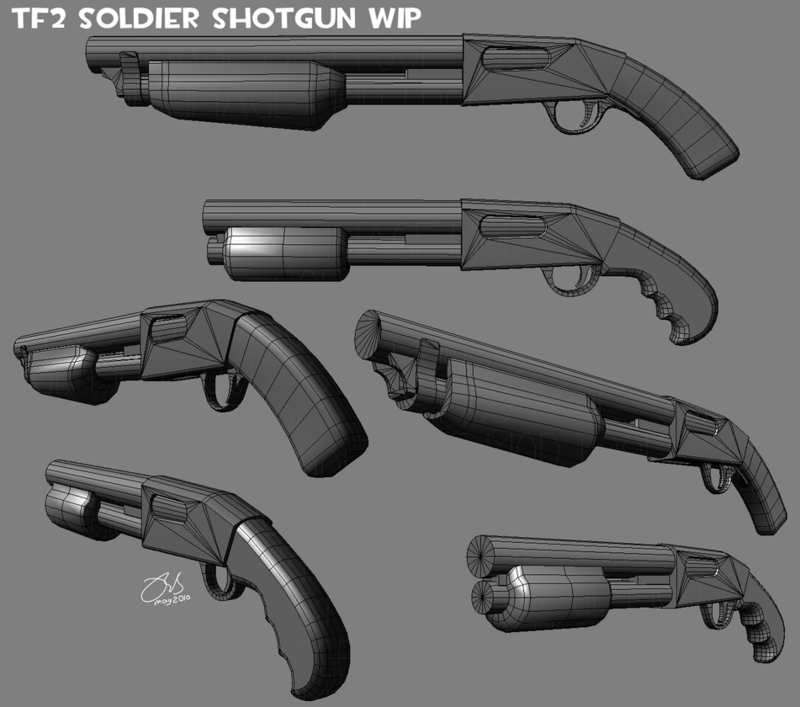 I'm not inclined to model dents into it because they would add more to an already high poly shotgun, and denting is actually very rare on the TF2 weapons. The only pronounced ones I've seen are on the baseball bat and the bugle, and neither are mechanical devices. After spending a load of time digging up shades of military green colours (olive drab) I did some tests of a couple against the TF2 colour pallette. You can see 9 of the tones on the top row of the below image. It turns out none of them complement both the Red and Blu schemes at the same time, and all of them favour red. In the meantime, the only green tone already in game and used on the Direct Hit, does complement both. It turns out the Direct Hit's green has equal levels of red and blue, while all real colours have more red in them which produces the varying level of yellow/browning, and if blue is stronger than red, it doesn't look like military green. This means the base green I'll use is going to be similar to the Direct Hit green, and the rest of the rows of colours look at variations of that colour. I've been compiling a selection of silhouette varations and looking into how colour variations affect them. I'm leaning towards #8 a lot but the base wood tone may get tweaked. Having the tube wrapped with wood like that differentiates it a lot from the actual bazooka design, whilst at the same time it ties it to the designs of the other rocket launchers - both of which are good things. I really liked how it looked like with a lighter shade of green, oh well. Also, my vote would have to go for 8. I have to admit your development process is pretty amazing. To comment on the weapons, I'm not too sure on the front of the launcher. It feels somewhat plain on the top side and the angle of the cone feels too wide. Maybe just a small ironsight in front of the cone, about half the size of the one on the rocket launcher - even if it wouldn't be useable, it'd add to the silhouette and it could just be passed off as a small joke. As for the shotgun, I like it, but I can't get rid of the feeling that it's too much like the regular shotty. It's the part between the barrel and handle, how you didn't make any changes other than the texture. Everything else about it looks great but if you could work in some kind of change there other than a different colour you'd have something that looks definitely different from the original. I'd go for 3, 7, or 8 out of those. That shotgun looks amazing by the way! It really reminds me of the SPAS shotgun. That gun is totally fully automatic so maybe you could work some sort of awesomeness from that idea!! I love this polypack and it I wish you the best of luck!! Alright, some responses to the feedback you guys left, I'll be posting an update on my modelling progress so far in a little while. Djokson - The green might still change before the end, since the testing I've done so far was with a pallette and not the models themselves, so repeating the test would probably be worth it. I can do quick tests by throwing a colour mask on the below images too, so I'll definately be looking into it. Batt - You're right about the bazooka stuff, when I tested my second model in game the blast deflector looked waay too big so it's been scaled down a little. Also while there was a sight, it was in the wrong place, so it's been moved higher up, but it's bugging me enough that I need to figure out a better design for it. As for the shotgun, I see no real reason to change that section. I did test an alternate design but it didn't look right. In addition my research has indicated that Valve have already picked the best shape for that type of gun in the given time period. If it gets anything there the most will be a change to the shape of the ejection port, if even that. I'll be changing the trigger guard anyway. Hotdogbunker - The Spas 12 is too modern a gun to fit TF2, though it did have some influence to the overall shape. I probably won't suggest it be automatic, since I've been aiming to build a pump action. That might also intrude on the Scout's Scattergun. Djokson, Khthon, Zai - Calls for 2, 3, 7 and 8 eh, with pretty much even split between wire and wood wrapping... I've done a comparison so see what you think when I put it up.